There are a lot of myths around SEO. SEO is in fact quite simple to understand if explained correctly. The challenge is, SEO companies have a vested interest in keeping you in the dark about what is really going on with your SEO campaign. At Kala Digital one of our values is transparency. You can always know what is going on with your SEO campaign and most importantly, we will explain SEO in simple and easy to understand language so you make the right decisions about your internet marketing. 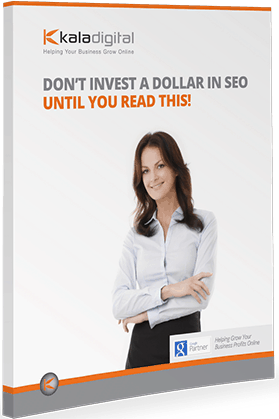 Free Ebook: Don’t invest in SEO Until You Read This! All of our website are built with SEO in mind. You don’t have to worry about complicated jargon like sitemaps, robot.txt files and meta tags because we already have. 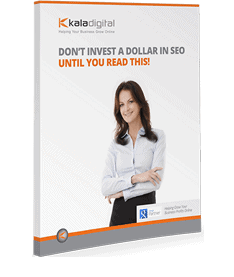 If you would like to learn more about SEO, please read our complimentary ebook. “Don’t Invest A Dollar in SEO Until You Read This”. We produce content which satisfies your users. A lot of business don’t have the time to create quality content for themselves, so we can handle that process for you. If you would like to learn more about Kala Digitals’ content creation philosophy, please contact us today. If you undertake an SEO campaign with Kala Digital you can be assured that we only use honest and ethical link building strategies, which are designed to help your business grow for the long term. When choosing an SEO provider, you must be careful that know strategies are implemented that try to shortcut the process of effective SEO as it could cost you a lot of revenue in the future in lost positioning of high demand keywords.